Our church is a wonderful community that reflects the diversity of God’s good creation. 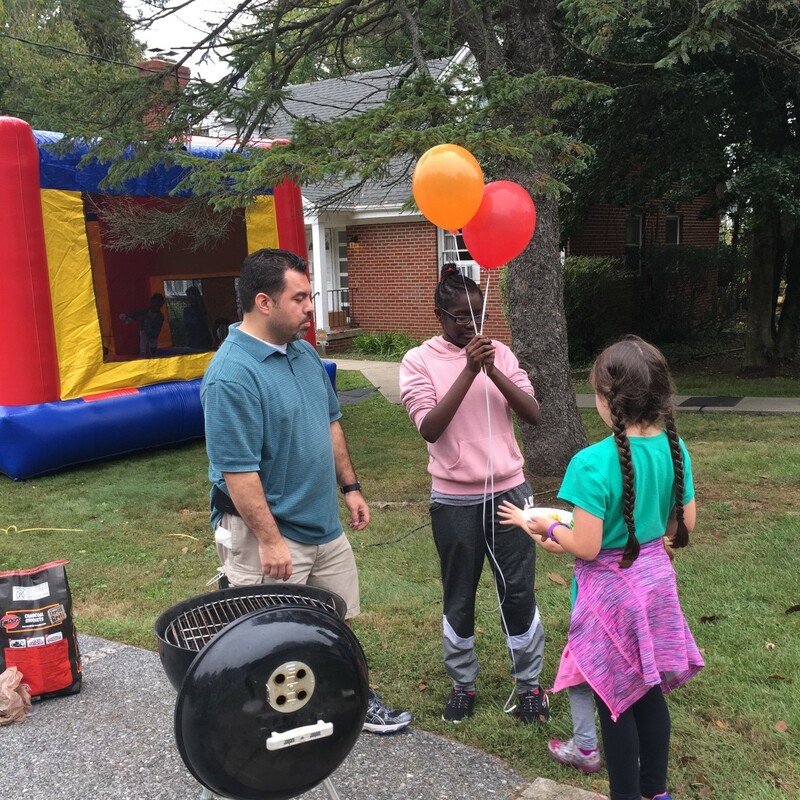 Small enough to feel like family, but active enough to find ways to connect through worship, study, service, small groups and fellowship activities. We are a gathering of people young and old and in-between. We are single, in a relationship, married, divorced, and widowed. Some of us were born in the U.S., others are recent immigrants from places like Jamaica, Trinidad, India, Ivory Coast, Nigeria, Liberia, Ghana and Sierra Leone. Some of us have kids and teens (we’d love to have more here! ), some don’t, others have watched their children grow and have kids of their own. We have people new to religion and those who have spent their lives in community of faith. We have people who know what they believe, and those who have lots of questions and even some doubt. That’s ok.
Oak Chapel is the kind of church where all are welcome (and by all, we really do mean all), the kind of church where it’s easy to join in with others as we discover our faith, give glory to God, and learn to love and serve our neighbors. Calming Sensory Bottles – If you liked the children’s message on 3/10 and would like to make this craft yourelf, here is the link. There will be a church-wide meeting immediately following service next Sunday to discuss the current state of the church. Please plan to stay an extra hour for this gathering. We are studying A Disciple’s Path. If you are interested in joining Oak Chapel, you need to be part of the study. Please contact Pastor Selena for the details. 5. Food Pantry NEEDS YOU!!! 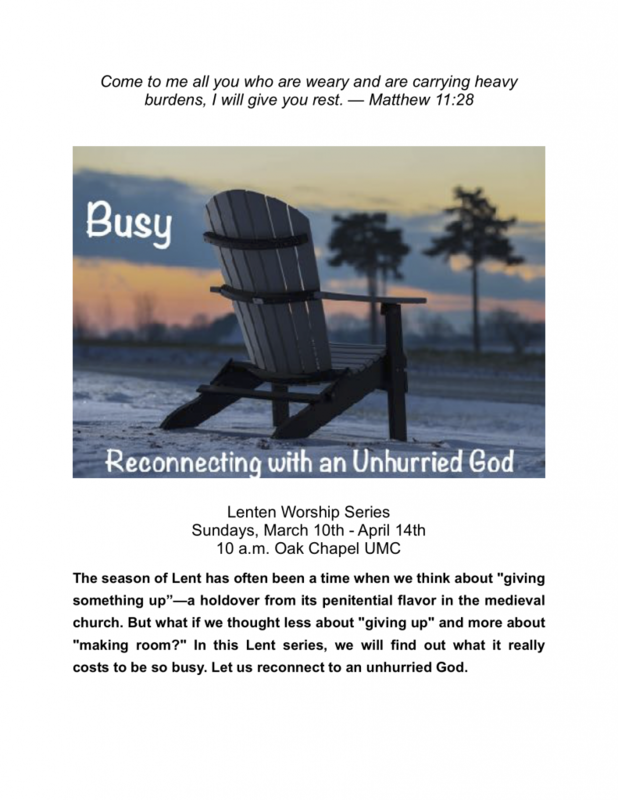 – Food Pantry – is a great opportunity to serve! If you can help with food stacking and/or packing, please contact Jo King or other members of Food Pantry team. next date is : April 27th, 2019. It’s time to order you Easter flowers. If you would like to contribute to the beauty of the sanctuary on Easter Sunday, you can purchase a flower. Order forms are available at the ushers station. If you have questions, please contact Valerie Mair. Our own Yvonne Kinsale has written an original play! “Carrying a Cross” will be performed one night only. So please mark your calendars and plan to attend. 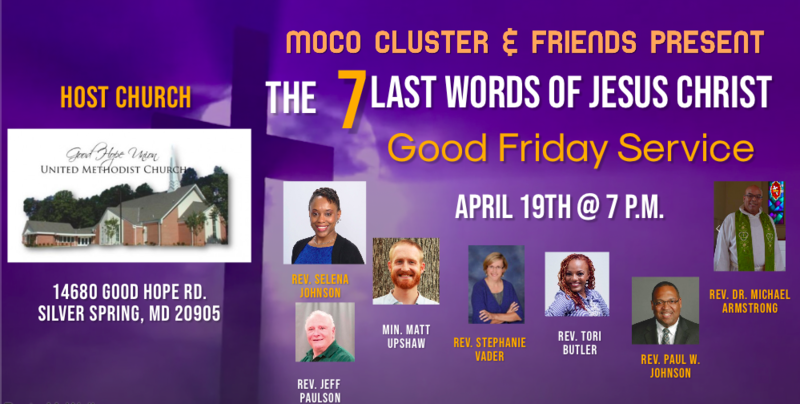 The cluster of churches will be worshipping together again on Good Friday as we hear 7 preachers on the 7 Last Words Jesus spoke from the cross. All the pastors in our cluster will be speaking. (Also, there will be a fish fry at Good Hope Union that day which all the churches are invited to support. Diners will be available until 7pm). 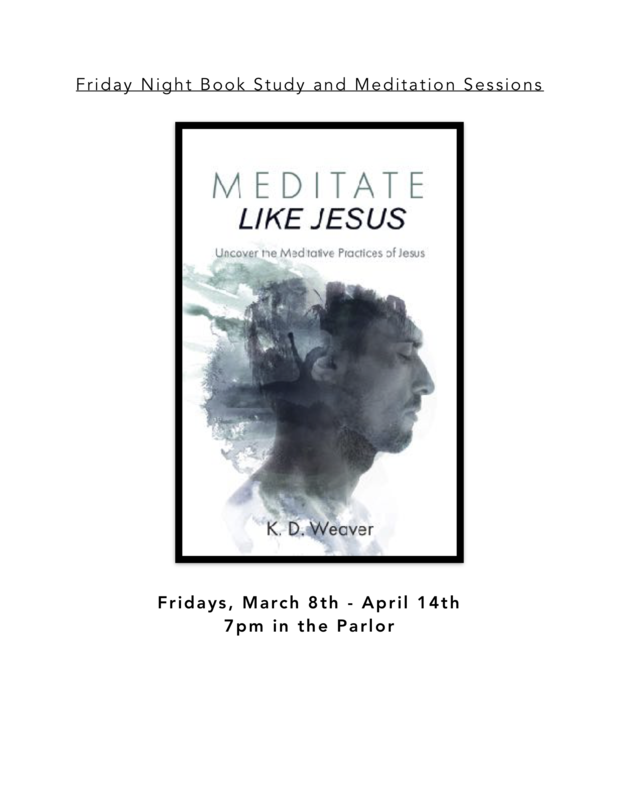 Pastor Selena will be leading a small group in meditation and study of this book from our book-signing event. 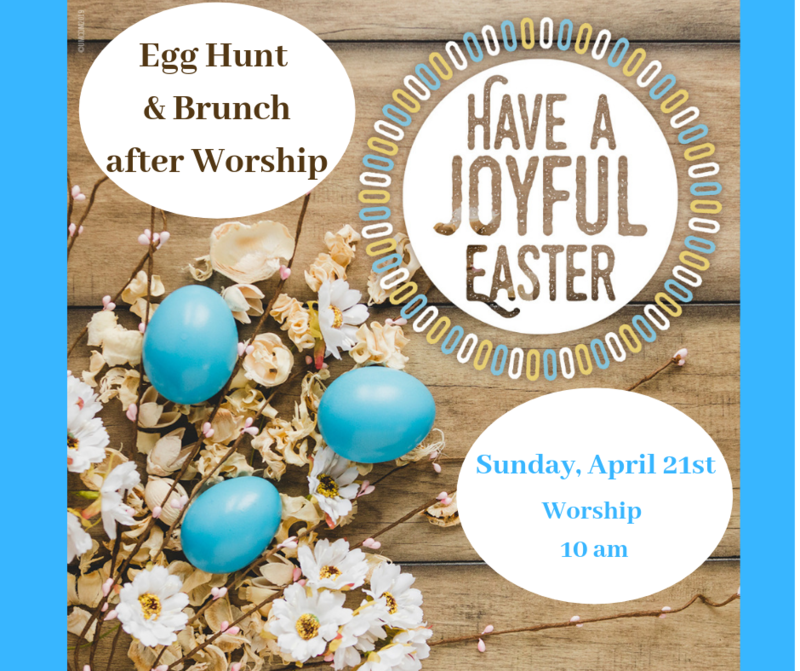 Our annual Easter Egg Hunt will be on Easter Sunday immediately following church. We do not need any eggs, only candy. If you can donate candy and/or help with other Egg Hunt tasks, please contact Valerie Mair. Christ is risen, indeed! Let’s celebrate with a meal together. If you are able to help with food donation, set up, decorations, or clean up please contact Audrey Hutchinson or Elizabeth Nyang. Childcare – Oak Chapel welcomes families with young children to our worship service by providing free infant and toddler care during church. From casual to dressy, come as you are. Everyone is welcome.